Our journey through Ryder Cup history begins with the birth of Sam Ryder Jr. He was born on March 24th, 1858 in a small community located on the outskirts of Preston, England. The 4th child of Samuel and Elizabeth Ryder, Sam Jr. grew up with a strong affinity for numbers and a love of cricket. He enrolled in Owen’s College with his sights set on a job as a teacher but an illness cut that dream short. Forced to withdraw from school and begrudgingly move back home to recover, Sam Jr. settled into the family business selling gardening supplies. While working for his father, Ryder Jr. soon discovered that there was an inefficiency in the gardening business that could benefit all of England. As the 19th century began to wind down, gardens were a luxury of the wealthy because the seeds needed were incredibly expensive. Ryder Jr. realized that by reducing the costs of shipping and receiving the seeds, he could reach England’s middle and lower classes. He moved his seed distribution to St. Albans, an area that featured train stations and access to the mail service. He created a catalog tailored to the poor with an emphasis of how gardening could brighten their lives. Ryder Jr. played to a class that had grown up as farmers, believing that by offering low-cost seeds, that all citizens of England would be able to afford gardens. The seed business, with the help of the catalog, flourished and Ryder Jr. soon became wealthy. Ryder Jr. didn’t take up the game of golf until after he turned fifty years old. As his catalog business took off, Sam spent much of time focused on philanthropic endeavors helping the poor and sick. With the demanding hours of running a charity and a business draining Sam’s health, Rev. Frank Wheeler, the pastor at Sam’s church suggested he become involved with an activity that promoted exercise. Ryder Jr. had cheated death on several occasions at this point, and with his charities hosting golf events on occasion, he believed that the outdoor element provided by golf would slowly rebuild his strength. Legend has it that after one round, Ryder Jr. fell in love with golf. He hired a teacher and spent hours perfecting his game. As he became a single-digit handicap, Ryder Jr. realized that like his seed business, golf was a game that was enjoyed mainly by the upper class. Professional golfers in England made little money and there were few tournaments for them to make a living on. Ryder was bothered by the fact that with golf catching on in the United States, England’s best golfers had to take the boat over to participate in tournaments like the U.S. Open. In an effort to promote golf on both sides of the pond, pros such as America’s Walter Hagan and England’s Abe Mitchell and George Duncan agreed that a competition that would pit the best of each country’s golfers would be beneficial. Needing a sponsor, Sam Ryder Jr. stepped up and paid 250 pounds for the first ever Ryder Cup trophy, with Mitchell being the inspiration for the golfer atop the award. After an aborted attempt to play the first Ryder Cup failed in 1926, all parties were able to come together in 1927 for the introductory Ryder Cup tournament at Worcester Country Club in Massachusetts. In a stroke of unfortunate irony, Ryder Jr. and Mitchell weren’t able to make it to the United States for the first tournament due to illness. The Americans won the four foursome matches and the eight single matches for a 9-2-1 victory. Ryder Jr. and Mitchell were present for the first Ryder Cup match on English soil in 1929, a victory for the home country’s team. 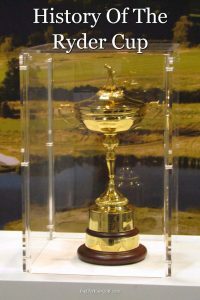 Up until 1959, the original structure of the Ryder Cup remained the same. A two-day event, with the first day covering the four foursome matches, playing alternate shot, followed by the eight single matches, played as match play events, on the final day. Starting in 1961, the format changed several times until it rested on the current 28-point format in 1979. In that year, the U.S.A. vs. England became the U.S.A. vs. Europe. The tournament now stretched to three days, with the first two days consisting of foursomes playing one session of alternate shot and best ball per day. On the final day, 12 single matches would help decide the Ryder Cup winner. The Ryder Cup has been held every two years with the exceptions being during World War II, which canceled the 1939, 1941, 1943, and 1945 versions of the Cup. In 2001, the terror events of September 11th in New York City, didn’t cancel the event but all sides agreed to push the Ryder Cup to a year later in 2002. Since the first Ryder Cup was officially played in 1927, the United States has played either Great Britain or team Europe 41 times. USA’s record in those 41 events is 26 wins, 13 losses and two draws. Great Britain competed in 22 Ryder Cups before they were folded into the European team. England’s record in these events were less than stellar with three wins, 18 losses and one draw. When the rest of Europe was included in 1979, the record improved dramatically with team Europe competing in 19 Ryder Cups with ten wins, eight losses and one draw against the Americans. In 1969 at the legendary Royal Birkdale Golf Club, teams USA and Great Britain were at each other throats heading into the competition. The competition was so tense with unsportsmanlike behavior that captains from both sides had to address their teams to relax and stop the hostility against their opponent. The reason that the 1969 Ryder Cup is remembered is because of what happened at the end of the event. The final single matchup of the day pitted two all-time greats in the USA’s Jack Nicklaus and England’s Tony Jacklin. After Jacklin tied the match on the 17th hole with a long eagle putt, both golfers had a chance to secure the Cup by winning the 18th. Nicklaus would get up-and-down for a par and with Jacklin needing a three-foot putt to draw the match, the Golden Bear picked up Jacklin’s marker conceding the putt. The gesture would go down in Ryder Cup history as “The Concession” and cement the ’69 Ryder Cup as one of the greatest Cup events in history. One of the greatest shots in recent Ryder Cup memory was hit in on the final hole in the 1989 Cup. Led by Seve Ballesteros and Jose Maria Olazabal, the European team held a small lead going into the Sunday singles matches. But the Americans put together a comeback and held a slight one-point lead, with the final hole of the last match to determine the result of the winner. American Fred Couples headed to the tee box of the 18th hole facing Christy O’Connor in an all-square match. Couples blistered a drive down the middle of the fairway, over 50 yards ahead of the 41-year old Irishman. Needing to knock it close to put pressure on Couples, O’Connor hit, what many believe to be the best strike of his professional career, a 2-iron that landed a few feet from the pin. Couples inexplicably missed the green with his 9-iron and O’Connor tapped it home for the birdie. His one-up win gave Europe a draw in the ’89 affair and they retained the Cup due to their 1987 win. In a similar situation, the USA team would claim the Cup in 1991 when Europe’s Bernhard Langer missed a six-foot putt that would have forced another draw but instead gave the Americans a one-point victory. One of the more dramatic comebacks in Ryder Cup history happened at the 1999 event at The Country Club in Brookline, Massachusetts. With the Europeans dominating the first two days of the competition, the US team was down 10-6 heading into the twelve single Sunday matches. Since the Euros had won the Cup in 1997, they only needed to win four of the twelve matches to retain the Cup. But the Americans came out ready to fight as they won the first six singles to take the lead 12-10. After both sides took two of the next four matchups, USA led Europe 14-12 and needed just to halve one of the two remaining groups on the course for the win. In what became one of the most memorable moments in Ryder Cup history, Justin Leonard sank a 45-foot birdie putt on the 17th hole against Spain’s Olazabal. The US team erupted onto the green to celebrate before Olazabal had the opportunity to strike his own 22-foot birdie putt. After the celebration, the Americans would be criticized for a lack of sportsmanship. Olazabal missed his birdie chance and the US team clinched the Cup in what was the greatest comeback in Ryder Cup history. The 2018 Ryder Cup will most certainly carry the feelings and emotions of the thrilling 2016 tournament. At Hazeltine National Golf Club, in Minneapolis, Minnesota, team USA and team Europe clashed over three days in an exciting back-and-forth that brought out the best the world of golf has to offer. On the opening Friday of the 2016 Ryder Cup, team USA raced out to an early lead in the morning alternate-shot foursomes. Jordan Spieth and Patrick Reed defeated Henrik Stenson and Justin Rose 3 & 2, setting the tone for a 4-point sweep for the team from America. But in the afternoon session, four matches played under the “best-ball” format, team Europe closed the gap with strong performances led by the team of Rory McIlroy and Thomas Pieters. After the first day, USA led Europe 5-3. Early Saturday matches were hard fought with Europe narrowing USA’s lead to one point. But in the afternoon session, Reed and Spieth defeated Rose and Stenson once again leading America’s charge and extending the lead to 9.5 to 6.5. Heading into the traditional Sunday singles matches, USA needed just five points to clinch their first outright Ryder Cup in eight years. Stenson bounced back from his struggles over the first two days with a big early win over Spieth for team Europe. But a flurry of victories for team USA from the likes of Dustin Johnson, future 2017 U.S. Open champion Brooks Koepka and Zach Johnson brought home the trophy for the golfers in red, white and blue. With the 2016 victory for the United States over a year old, qualifying for the 2018 Ryder Cup is well beyond underway for hopefuls. Since the last tournament was in America, the following tournament will continue the tradition of being in Europe. But in something that is a first for the Ryder Cup, the tournament will be hosted in the country of France for the first time ever. In the suburb of Paris known as Saint-Quentin-en-Yvelines, the event will be held at the city’s historic Albatros Course of the Le Golf National. Running over 7,300 yards, the par-71 course is well known to golfers who play the European tour as the Open de France is played there annually. Both squads have already determined who will make the decisions as the USA team will be captained by Jim Furyk, a veteran PGA professional. Furyk participated in nine Ryder Cups as a player with a 10-20-4 overall record. For the European team, Thomas Bjorn will helm the squad. Bjorn, a three-time Ryder Cup participant as a player, had an overall record of 3-4-2 in the event. Teams will continue to be built through a point system that values victories and high finishes on the PGA and European tours. But other than the traditional point system, both captains have slightly altered the way their choices will make a way onto the team. For team Europe, Bjorn will have the opportunity to select four captain choices rather than the three selections previous captains were given. Bjorn has also made playing on the European tour essential as golfers hoping to make the Ryder Cup team must maintain a tour card in Europe as well as competing in a new group of tournaments known as the Rolex Series. The Series, which mirrors the FedEx Cup on the PGA Tour, will have eight tournaments held on courses around the world. Players will be encouraged to play these Rolex events as points from the Series will affect their final Ryder Cup point total. Captain Furyk will also be given four choices but for team USA there are changes in how points will be acquired. The 2018 majors will be the source of the majority of rewarded points. Winning the Masters, U.S. Open, the Open and PGA Championship will give the golfer double the points of a normal tour win and undoubtedly put that golfer in a position to clinch a spot on Furyk’s team. The core of both rosters won’t change dramatically from 2016 to the 2018 tournament squads. For team Europe, having the event take place in America made for a hostile environment, creating difficult times for golfers like McIlroy. Rory was endlessly taunted with the gallery shouting insults and, at one point, poking fun at his failed engagement with tennis pro Caroline Wozniacki, by singing Neil Diamond’s “Sweet Caroline” to the Irish native. McIlroy was game for the challenge, showing emotion in ways few had seen, and even gave some of the grief back by having one of the more hostile members of the crowd ejected. McIlroy won’t endure the same harassment in front of the French crowd but his Hazeltine experience could add motivation to McIlroy’s desire in bringing the cup back to Europe. Team USA will, most likely, bring the dynamic duo of Spieth and Johnson back to Le Golf National but by the time of the late September 2018 tourney, one has to wonder if Koepka will have inserted himself into the conversation as the best player in America. Regardless of whoever fills the USA roster, having the tournament on European soil will create an environment that will rival what team Europe experienced in 2016.